JetBlue Airways’ frequent flyer program, TrueBlue, offers you points for every dollar you spend so that you may potentially get a free future flight. This frequent flyer program is free to join, and you create your membership directly online. Also, children under the age of 13 can be enrolled under a parent or guardian's account. JetBlue says that TrueBlue points will never expire for any reason. And travelers can use their points for any seat at any time, with no blackout dates, which is usually the case with legacy airlines. Families can pool their miles to book future flights. TrueBlue members receive three points for every dollar spent toward a flight (excluding taxes and fees) on JetBlue Airways. There are other ways to earn points depending on how you spend your money. Book Using JetBlue.com: You can get extra points when flights are booked directly online at JetBlue.com. Types of Fares You Buy: You can increase your points per dollar spent depending on the type of fare that you purchase from JetBlue. There are four tiers of fares that earn you additional points: Blue Fare, Blue Plus, Blue Flex, and Mint Fare. If you purchase a Blue Fare or a Mint Fare, then you can earn an extra three bonus points per dollar for a total of six points per dollar spent. If you purchase a Blue Plus Fare, you can earn a total of 7 points per dollar spent, and a Blue Flex Fare can earn a total of 8 points per dollar spent. Use JetBlue Services: Other services that can earn you additional points include using the JetPaws service to transport your pets or purchasing an extra legroom seat. And, if you purchase a JetBlue Getaways vacation package or a cruise vacation, you can be eligible for more points. Types of Purchases You Make: You can also earn extra points when you use JetBlue partners like Lyft, Groupon, or Budget car rentals. JetBlue Credit Cards: You are awarded 10,000 to 40,000 points extra points if you use JetBlue-branded credit cards to make everyday purchases totaling over $1,000 within a 90-day period. Fly Frequently: Frequently flyers who fly either three round-trip flights or seven round-trip flights in one calendar year are eligible for 5,000 and 7,000 extra points, respectively. If you are a frequent, long-distance flyer who takes more 10 or more round-trip flights in a year of 1,600 miles or more, you are eligible for 10,000 bonus points. The points you earn can be used toward a future free flight or you can use your points in a myriad of other ways. If you have points to redeem, select "points" instead of "dollars," when you search for your next flights. Get a Free Flight: If you are using your points to redeem a flight, the amount of points a certain trip requires is directly tied to JetBlue's current fares. When flight fares are lower, so are award flight point fares. 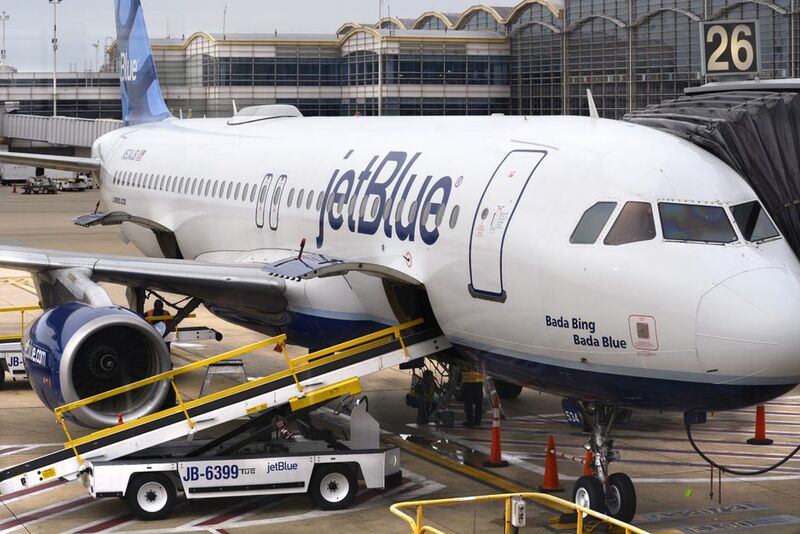 Free flights using points are called “award flights,” which can be one-way or round-trip tickets to JetBlue destinations. Just as regular fares vary, the points required for an award flight will also vary depending on the destination, day of the week, season, and advance booking window. Government taxes and fees apply to an award flight and are the responsibility of the passenger. Donate to Charity: Donate your points to your chosen charity, and in turn, they will be able to use the points for JetBlue flights to help their cause. Use on Hawaiian Airlines: Redeem TrueBlue points on Hawaiian Airlines flights. TrueBlue members can earn TrueBlue points on all Hawaiian Airlines flights. Hawaiian has a network that spans over 30 destinations in more than eight countries around the world. You can also earn TrueBlue points with Hawaiian based on the type of fare you purchase and the distance you fly. Use to Book a Getaways Vacation: You can pay for your Getaways vacation package by using cash and TrueBlue points. Any cash you apply to the Getaway earns you additional TrueBlue points. Get Magazine or Newspaper Subscriptions: Redeem points and subscribe to your favorite magazines or newspapers. You can get home delivery or online subscriptions. There are hundreds of magazines and newspapers to choose from that are redeemable with 300 or more points. Transfer Your Points to Someone Else: You can transfer your points to another member's account, directly, in a member-to-member transfer. How Do Airlines Make Money off Frequent Flyer Redemptions?